The Recover from the Holidays 50k is takes place every New Year's Eve in Huntsville at the John Hunt Cross Country Running Park in Huntsville. New Year's Eve 2011 marked the 17th annual running of the event. The race is always New Year's Eve, no matter the day of the week. This year, it fell on a Saturday. The Huntsville Cross Country course is a 3 mile loop (really, it's more like a 1.5 mile out and back) on dirt trails with one significant hill. The course has a 1 mile and a 2 mile turnaround point. 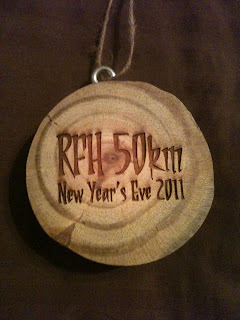 The RFH 50k does a 1 mile loop followed by 10 repeats of the 3 mile loop for 31 miles total. 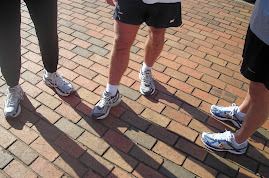 This year saw a record number of entrants and finishers, with 147 registrants and 81 finishers. The results are both at the RFH 50k website and the HTC Website. The overall winner was 47 year old local ultra running legend DeWayne Satterfield of Huntsville in 3:50:59, sporting a dress shirt and a tie for the whole run! The female winner was Tammy Tribett of Manassas, VA, in 4:25:30. Limestone County finishers are listed below. Congratulations to Andy Davidson and Melissa Oppman for completing their first ultra-marathon at RFH 50k.